The TV networks in America considered their non-stop coverage their finest hour, pointing to the use of embedded journalists and new technologies that permitted viewers to see a war up close for the first time. But different countries saw different wars. Why? For those of us watching the coverage, war was more of a spectacle, an around the clock global media marathon, pitting media outlets against each other in ways that distorted truth and raised as many questions about the methods of TV news, as it did the armed intervention it was covering-and it some cases-promoting. 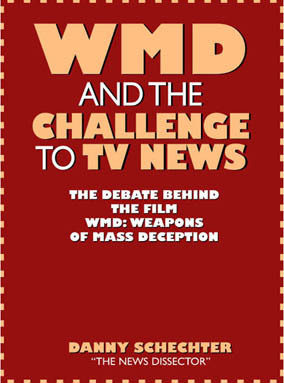 WMD, a 100 minute non-fiction film, explores this story with the findings of a gutsy, media insider-turned-outsider, former network journalist, Danny Schechter, who is one of America's most prolific media critics. Schechter says he "self-embedded" himself in his living room to monitor media coverage, by fastidiously tracking the TV coverage on a daily basis. He wrote thousands of words daily about the coverage for Mediachannel.org, the world's largest online media issues network, and then collected his columns, blogs and articles in a recently published book, EMBEDDED: Weapons of Mass Deception (ColdType.net & Prometheus Books). A Nieman Fellow in Journalism at Harvard University, and radio news director turned CNN and Emmy Award winning ABC News Producer, Schechter wears several hats at the same time. 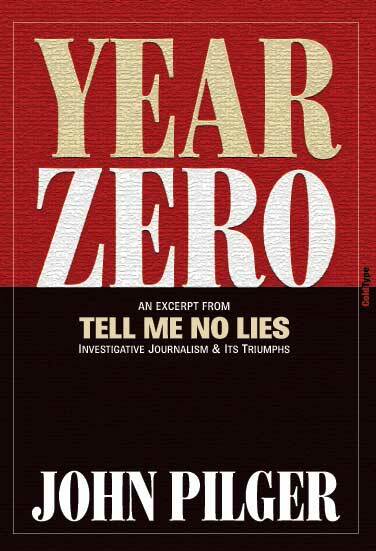 He is now an award-winning independent investigative journalist and filmmaker as well as an outspoken author. Danny Schechter is not afraid to take on his own industry. WMD busts through so-called "objective reporting" to challenge media complicity with the government and its cooperation in presenting the Iraq War the way it did. This is a hard-hitting, yet personal film that looks at the television war and asks why the American audience lapped it up and how the Pentagon helped shape media coverage. 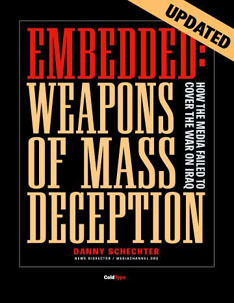 Danny Schechters new film WMD: Weapons of Mass Deception, which blasts the media coverage of the Iraq war opens this month in movie theaters across the United States. News Dissector Schechter, blogger in chief at Mediachannel.org, has collected his recent columns on the issue, and the film's script into a new 102 page e-book. Download the book here, free of charge . 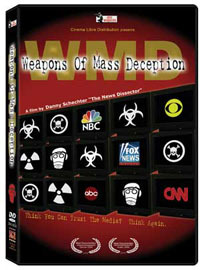 . .
PLUS: We've also got a 14-page Teachers' Guide to the film, WMD: Weapons Of Mass Deception, designed to help students understand the war in Iraq and the role of the media. There were two wars going on in Iraq  one was fought with armies of soldiers, bombs and fearsome military force. The other was fought alongside it with cameras, satellites, armies of journalists and propaganda techniques. One war was rationalized as an effort to find and disarm WMDs  Weapons of Mass Destruction; the other was carried out by even more powerful WMDs, Weapons of Mass Deception. The TV networks in America considered their non-stop around-the-clock coverage their finest hour, pointing to the use of embedded journalists and new technologies that permitted viewers to see a war up close for the first time. Critics of the coverage, such as veteran journalist and media watcher Danny Schechter, a former ABC and CNN producer, consider much of the U.S. media complicit in the promoting and cheerleading for a war in which some of the reporting was sanitized, staged and suppressed. Schechter, author of Media Wars: News at a Time of Terror, The More You Watch The Less You Know and News Dissector, brings an insiders knowledge based on 30 years in journalism with an outsiders perspective to critiquing media coverage. Throughout the war, as he describes, he was self-embedded at Mediachannel.org, the worlds largest on-line media issues network, writing a 3000 word daily dissection of the global coverage based on a wide range of source. Now that coverage, including articles and essays published elsewhere, appears with a new introduction and hard-hitting analysis as Embedded: Weapons of Mass Deception, a book length study of the new merger between the military and the media. The book includes reports written in late May, 2003. What are the catches? None. ColdType has no membershop fees or charges of any kind. We'll never ask you for cash and we won't sell your name to any other list. Click here to go to the COLDTYPE home page - read John Pilger, George Monbiot, Norman Solomon, Robert Fisk, Edward S. Herman, Michael I. Niman, Danny Schechter and many more top writers. Download free books, magazines, newspapers and photo essays . . .